The iPhone 4 officially landed in China yesterday, so I bought one from the new Apple Store at Xidan in Beijing. In China, Apple sells its iPhones unlocked and without a contract (16GB = USD747, 32GB = USD895), so you can pretty much stick in any sim card and go. This is how I like my phones — and why I skipped buying an iPhone 4 in Sweden or the US (contract-only) or Belgium (hefty VAT markup). I soon discovered that the Chinese version of the iPhone 4 comes with an aggravating quirk, though: The built-in Maps app is crippled. My phone’s base map is hard-wired to Google Maps’ censored dataset for China, where the depiction of China’s borders complies with the official propaganda of the Chinese government. 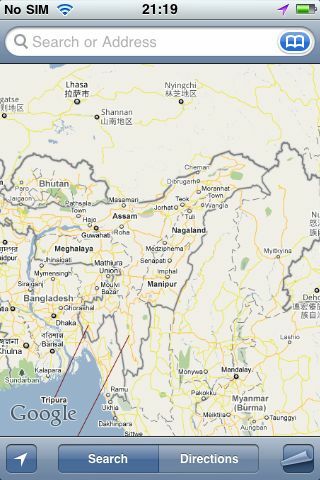 It does not, for example, show the region of Arunachal Pradesh as being disputed by China and India. On my phone, it belongs to China, even though the facts on the ground belie it — it is currently administered by India. I discovered this quirk because the first thing I did after activation was to do a wholesale install of the backed-up contents of my old iPhone 3GS, bought in Hong Kong. On my 3GS, I knew exactly how the Maps app worked: If I went online in China without a VPN, the Google Maps dataset was an English-language version that nevertheless had borders which complied with Chinese law (i.e. 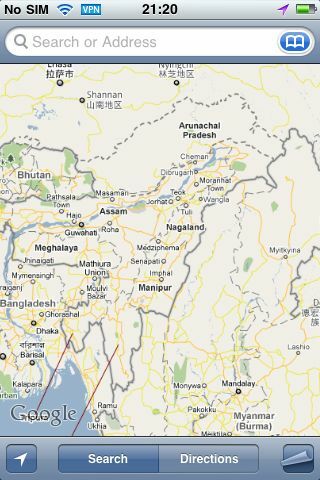 they show Arunachal Pradesh as being Chinese). As soon as I turned on my VPN to tunnel into San Francisco, the refreshed base map automatically showed the proper international version, the one which the rest of the world gets to see. You could make the case that Apple and Google just want to comply with local Chinese law — even though the legality of Google’s mapping service in China is even now in question, as it still needs to comply successfully with a new Chinese law that requires a license to publish online maps in China. But my new Chinese iPhone 4 does things differently, even though ostensibly it is meant to be running exactly the same software as my old phone. The Maps app always shows China’s borders as the Chinese government would have them — regardless of whether I use my VPN or not. If I take this phone to the US or Europe, it will still show the same crippled, semi-fictional base map. And there is no way that I can change it. (The Chinese iPhone 4’s dataset is slightly different from the one served inside China to my Hong Kong iPhone 3GS, however: on my Chinese iPhone 4, place names outside China are both in Chinese and English (and sometimes also in a local script, such as Arabic). San Francisco, for example, is accompanied by its Chinese name, ÊóßÈáëÂ±±. That’s not the case on my Hong Kong iPhone 3GS — all names outside China are just in English (and sometimes also in a local script). This is not the first time Apple has willingly crippled its iPhones to legally access new markets. In Egypt, the first iPhones lacked a GPS receiver to comply with a local ban. The first Chinese iPhones lacked wifi. iPhone 4s currently sold in the United Arab Emirates lack the Facetime feature, possibly to abide by VOIP regulations. The question is whether crippling the Maps app on Chinese iPhones is a legal requirement, or whether it’s a case of Apple (and Google) going beyond the call of duty. Is it really illegal to sell a phone where the software settings allow you to choose a base map different from the default? In any case, is it a good idea to rely on a map that may not ever get a license to be legally served in China? Shouldn’t that possibility argue for the ability to choose different base map datasets (OpenStreetMap, for one, perhaps Bing Maps)? Right now, the Maps app reminds me of those cold-war era Soviet radios, without a dial, able to receive just one (propaganda) channel. Because Apple’s own apps are not deletable, I’ve now buried the Maps app in an obscure folder, and instead replaced the icon with a direct link to maps.google.com, whose mobile-enabled mapping template is just great: Compared with Apple’s app, it serves up a reality-based map in China even without VPN, has much better search (with suggestions) and content such as Wikipedia and Panoramio photos. (Directions are lacking in the mobile version, though.) 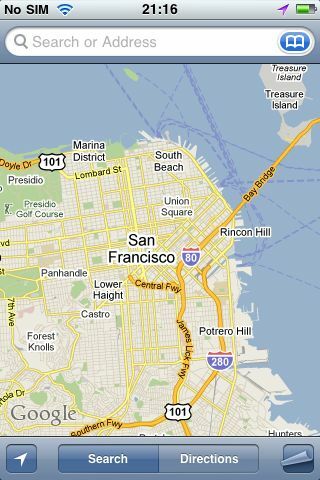 Another option is to use Google Earth for the iPhone, which looks simply awesome on the iPhone 4’s screen. Luckily, routing around censorship on the internet is still easy, though not with any help from Apple, in this case. [Update 2010-09-28: A new entry here on Ogle Earth addresses the Chinese iPhone 4’s curious hardwired Google search results, and adds more Maps screenshots]. I just bought the iPhone 4 in China as well, at the Huaihai Rd. store in Shanghai. This change to the Google map app has me furious. I don’t know if you noticed, but not all foreign cities have their street names in English and/or the local language. Try Toronto for example. Only Chinese. How freaking useless is that? No taxi driver in Toronto is going to know the Chinese street names. Without having English it makes the maps app entirely useless outside of China and the few places that have English names as well. I tried with a VPN and got the same results. I’m going to Munich soon and I was hoping to use this app…looks like my new phone is failing me. i’m in the same situation… do u think is it possible to somehow… reinstall the operative system to avoid this? or perhaps giving back the phone to applestore? You should definitely try reinstalling the OS. I’d suggest getting your computer VPNed into the states so the iTunes server thinks you are there, then getting the latest OS from their servers and hopefully you’ll end up with an unlocked US phone. hey Craig… that was a nice suggestion…. however.. i tried and it didn’t work :((( … so today i’m going to talk to an “applestore’s genius” to see if there is an alternative solution … otherwise i’ll try to get my money back…. I was just going to try the VPN reinstall. Thats unfortunate, everything else about this phone seems to be working besides maps. The google search bar in Safari defaults to Google.cn, which is dumb because that just brings you to a page that tells you to search on Google.com.hk, and I find Google.com.hk isn’t as good as regular Google.com. Facetime doesn’t seem to activate either, although I’ve read thats a problem with Unicom that’s being worked on. Thanks for following up, everybody. I was going to go see a genius tomorrow in the Sanlitun store, but I guess there is no need now. I think I will keep the phone, though the hardwired google.cn search in Safari is also a really idiotic turn. But there’s other browsers in the app store now, so I will go take a look there. Imagine I had these restrictions on my MacBook Pro. I’d go postal. I have a couple of questions to those who’ve bought an iphone 4 in China. I understand the concerns about the maps app. However does the maps app give the correct location? On 3GS google maps has always been about 500 metres out when using GPS. I was wondering if the new borders and chinese characters for local place names could be a trade off for actually getting the location correct in which case I don’t mind so much. Is it possible to connect to a foreign itunes store account? My itunes account is a UK one. Is the youtube app also missing as youtube is blocked in China? The google.cn search thing happens on every iphone. My iphone is set to UK settings but when in China the URL is redirected to google.cn which in turn redirects to google.hk – I think thats the ISPs rather than Apple. Are there any other limitations on the Chinese iphone 4 that we should be aware of? Are the phones offered by Unicom unlocked for any SIM or only the ones in the Apple store? How does it display the disputed Senkaku/Diaoyu islands? The disparity between the satellite imagery and the maps is due to incompatible map datums. It’s a quirk shared by Google maps and other online mapping services. It’s still there. Just noticed the YouTube app is missing, but the mobile web version is better in any case. The phone works with my Swedish account, so it will work with your UK account. I don’t remember my 3GS redirecting to google.cn, but will check later. Are you still able to use a VPN? Does the VPN just not help in the instances of this particular app? Do you already need an account if you want your iphone to register on an outside China account or can that be set up for anyone that gets an iPhone? Lauren, yes, the VPN works, it just doesn’t have an effect in the Maps app. I’m pretty sure hat if you can open the account in iTunes on your computer, you will be able to use it on this iPhone. I activated mine without problems. I have no problems accessing and buying apps from my UK iTunes account, so you can breathe a sigh of relief. Have you tried the maps app on the iphone 4 without the china unicom sim card inserted in the phone? Moses, I just checked, and it makes no difference. Same map. If you’re subscribing to these comments: I’ve now written a follow-up entry that addresses the hardwired Google search results in the Safari Google search bar, and also adds screenshots from cities where street names are missing or only in Chinese. What Google replied to it? Did you ask them? Does Google modify Chinese boards for mobile maps app only or do they do it for Google Map desktop version also? I’m sorry, but this article is overly sensationalistic and completely wrong — the data come from Google, and the Chinese characters are being shown because you have your locale set to China. Change it back to English, and suddenly everything stops being in Chinese. I know Apple is the new Microsoft, and it’s cool to bash on them, but please make sure the facts are right first: there is no crippling of the maps app on the (Chinese) iPhone 4. Any limitations and problems with the data shown by the Maps app come from Google. Now, whether or not those data *should* be censored is an entirely different discussion. To be clear: there is NO crippling of the iPhone 4 (sold in China or anywhere else) Maps application beyond the voluntary changes Google has made to its data set. No, you are wrong. Have you read the article? There is no way to get the Maps app to show a non-Chinese map on the Chinese iPhone 4. Changing the region format doesn’t help. If you do know a way, by all means share it with us. i know it’s difficult to believe.. but facts are.. i have a friend who bought an iphone4 in HK using a china mobile sim in shanghai…. language set to english… maps are in english…. another friend bought iphone4 in UK… unicom sim in shanghai… language set to english…. 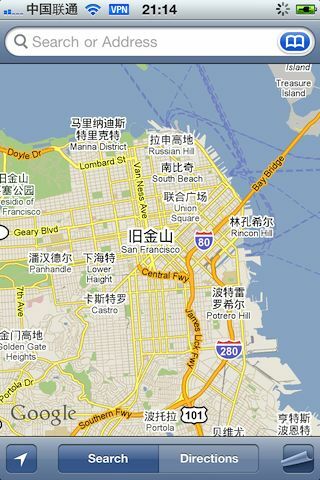 maps are in english….. i bought my iphone4 in shanghai at applestore… language set to english… china mobile sim…. maps are in chinese… if these my two friends change language, maps change accordingly… mine no…. applestore geniuses couldnt resolve the issue…. as i underline before i dunno if the limitation is hardware or software nor i know the reason behind the choice …. but the applestore genius’ answer is pretty clear to me… it’s not possible to change it…. so it’s not a bug it’s a deliberate choice. This is why you buy electronics in Hong Kong! I will tweet and blog about this, it will become a huge news!! Seems that Apple is selling poorer featured iphone4 but at a higher price in China than in HK. Everyone should buy iphone4 from Hong Kong I think. There is warranty for HK iphone 4 in China, as HK is a city of China and Apple’s warranty within the country of purchase applies. This has been confirmed by Apple China customer service center. Also, iphone4 from China may have some call/message/URL/Email logging installed. There is realy no point buying iPhone4 in china. Regarding the map offset in China issue, I believe it is not simply a datum problem because such problem never happened in other locations. Things are absolutely normal for HK google map. Moreover, the satellite map in China is normal as well. If it is a datum problem, the satellite map should also have the same offset probelm. In addition, if this is really a problem, it should have been fixed long long ago. I guess the real problem is: it is the requirement from China Government. The CN Gov don’t want ppl to be able to gather (riot…) at location that can be easily shared and communicated. Why the satellite map is correct? Because this cannot be cheated, people can see the building and will know where they are and hence will find out that the map is wrong. You can also to the check the border between Hong Kong and ShenZhen. In google map HK, the border area is deliberately distorted. 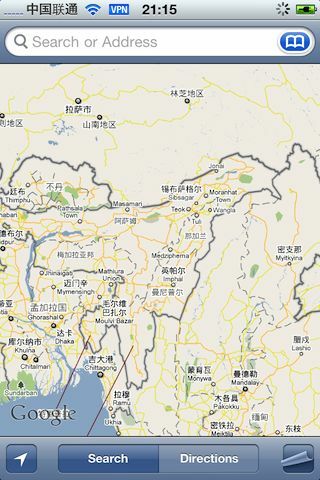 In google map china, the map is correct but offset a few hundred meters. One more thing, my friends told me that the GPS map device for driving also have the same map offset problem in China. These maps runs on Windows Mobile devices and are offline maps. So I am 100% sure that this offset problem must come from China government. Is there any way to check the installed Root CA for iphone 4 from China? I am quite sure that there must be some evil CA cert installed to allow the government to do man in middle attack! clearly the chinese seem to have an inferiority complex. what are they worried about ? why are they trying to conquer Indian lands on the sly ? why are they dragging apple into this, and why is apple getting into this controversy unnecessarily ? I blame apple for changing course here. if previous apple maps showed AP as a part of India – apple is responsible equally for messing up. Boycott Apple.